The Cleveland Browns entered the 2017 NFL draft with a haul of draft picks and a dire need for a quarterback. Yet, despite rumors swirling for days that the Browns might use their No. 1 overall pick to take North Carolina quarterback Mitchell Trubisky (ESPN’s 27th-ranked prospect), they were conservative and selected the draft’s top prospect, Texas A&M defensive end Myles Garrett. By the end of the round, the Browns still didn’t have a QB, having passed up the chance to take Deshaun Watson in the 12th spot, as well. But failing to use any of [their draft picks] on a high(er)-end quarterback will doom them in the short- and mid-term. Unless you think the Browns can grow with 2016 third-rounder Cody Kessler or — gasp — recent acquisition Brock Osweiler, it’s difficult to see how they can move forward while continuing to slow-play the position. I see this type of argument made a lot: A team that needs a QB needs to take a QB. But it isn’t quite that simple. 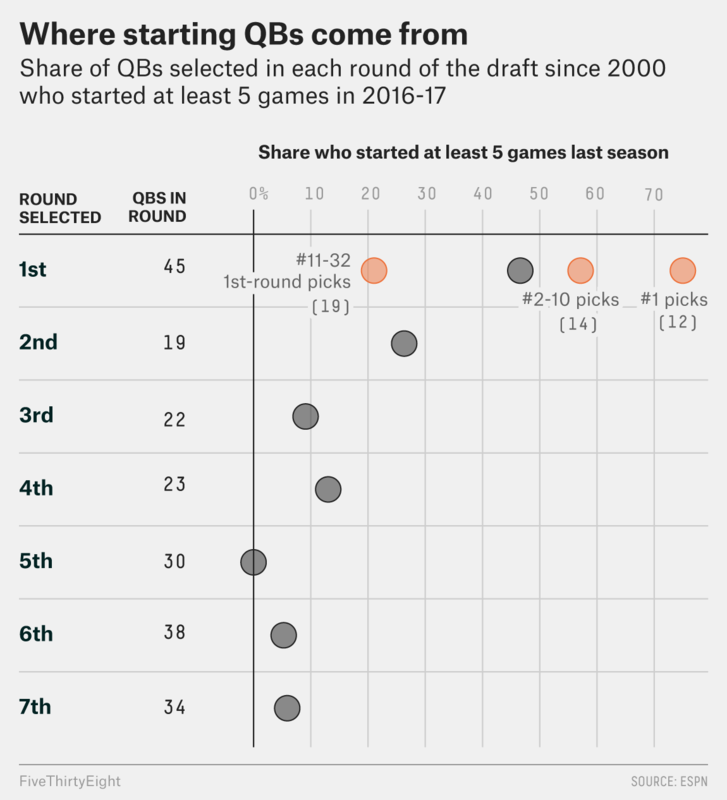 Quarterbacks are almost always high-risk prospects, and investing in a bad quarterback can kill a franchise just as easily as not having one. It’s a bit of a cliche, but there is only a small group of people walking this earth who are capable of playing quarterback for the NFL. And most QBs taken in the draft aren’t among them. QBs have long careers, and (by definition) there are only 16 at any time that are better than average starters. Of the 211 QBs drafted in the Brady era, what share from each round were in starting roles last year? 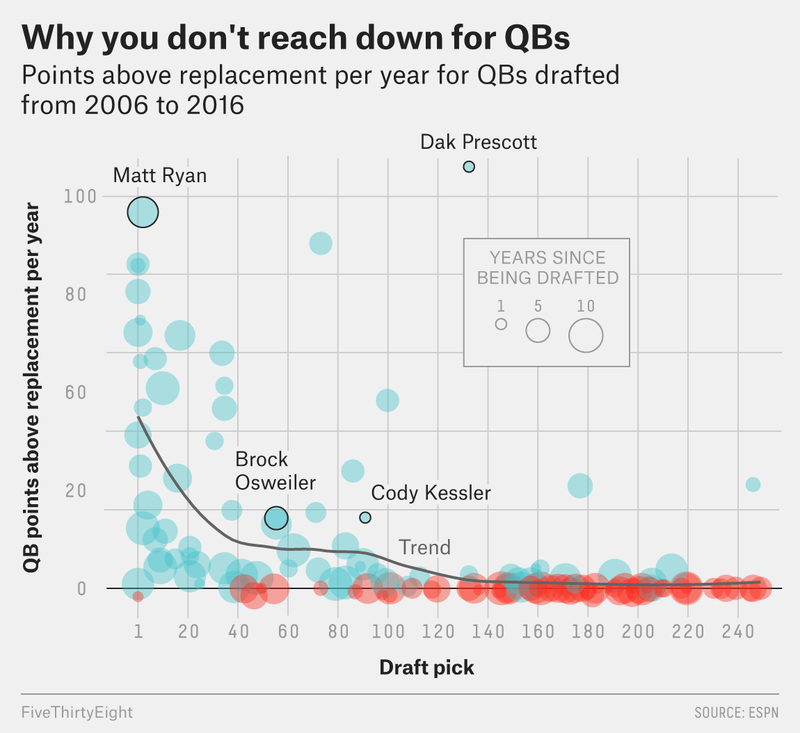 That chart may look like taking a QB at the top of the draft is even more imperative. But the key point is that, after the blue-chippers, things get dicey. So when you’re sitting in a blue-chip draft position (as the Browns were), and you don’t see any blue-chip QBs, taking the next-best thing doesn’t get you a rough approximation of a blue-chip QB. It gets you something substantially different. OK, that’s just a snapshot of where things stood last season using a crude (though dramatic) metric. Ultimately, a QB doesn’t contribute just by playing games, he contributes by playing well in them. (Though one, of course, can certainly follow from the other.) While I generally still think QB value is a mystery, there are some metrics – such as ESPN’s QBR – that at least try to divide credit between a QB and his team. Again, you can see that QBs who are consistent contributors are concentrated very early in the draft – so much that, by the time you get 30-40 picks into the draft, a QB’s expected contribution drops below Brock Osweiler/Cody Kessler levels. It’s amazing to me that Osweiler has spent three years on the bench, played reasonably well for half a season, and played badly enough in his only year as a full-time starter that his team gave away draft picks to avoid paying him – and yet, for all that, he has had above-average production for a second-round draft pick. That’s why you don’t reach down for QBs in the draft. The three quarterbacks taken high in the draft may yet prove to be as good as their draft positions suggest. Projections are often wrong, and NFL teams presumably know how to evaluate talent. You’d think as much, anyway. But reaching down in the first round hasn’t worked out very well of late. ESPN’s scouting gave Trubisky, Watson and Patrick Mahomes grades of 89, 88 and 85, respectively. Since 2009, six quarterbacks with grades lower than 90 have been selected in the first round, and a quick “where are they now” isn’t pretty: Christian Ponder, Josh Freeman, Brandon Weeden, Tim Tebow and Teddy Bridgewater did not play in 2016 (whether on account of poor play or injury), while E.J. Manuel had 131 yards passing (for the season) as a backup in Buffalo. And again, the Browns already have two players on their roster who have performed like late-first-round QBs! Of course, it’s always a gamble – and I have nothing against gambling – but part of being a good gambler is understanding the odds you’re getting. If the Browns thought none of these prospects was worth betting the franchise on (putting them in agreement with projections), their first-round choices were prudent. Brady was the only starting quarterback last year who was drafted before 2001. Two were undrafted, though the pool of undrafted would-be NFL QBs is impossible to measure.